WELCOME to the official website of Alpha Phi Alpha Fraternity Inc. - Omicron Eta Lambda Chapter (OHL). We hope to keep visitors in touch and informed with the history, goals, and activities of this illustrious chapter chartered on August 31, 1985 and seated in the Nation’s Capital. 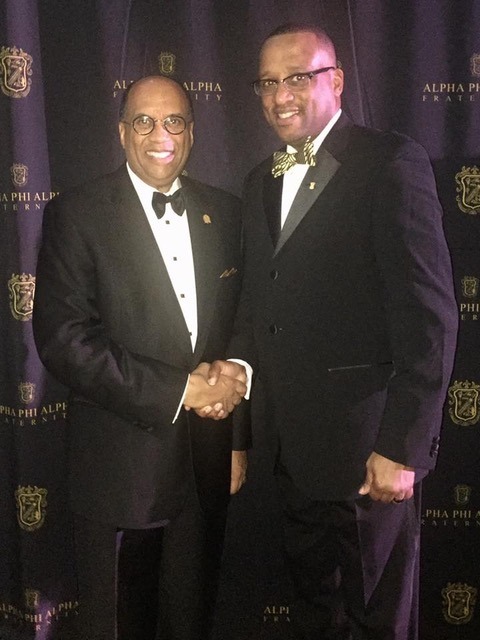 The Omicron Eta Lambda Chapter, in keeping with the Fraternity’s Mission Statement, “Alpha Phi Alpha Fraternity, Inc., develops leaders, promotes Brotherhood and academic excellence, while providing service and advocacy for our communities,” remains committed to the national programs and partnerships of the fraternity. Our national programs include the March of Dimes/March for Babies, “Brother's Keeper", "Go to High School, Go to College" and "A Voteless People is a Hopeless People". Working with these partners and programs allows Omicron Eta Lambda to effect social and political change on several different levels in Washington, D.C.
Our fraternity is committed to the educational assistance within our community by the tireless work of our Educational Committee, OHL’s Educational Foundation (501[c]3) and the many educators in our Brotherhood. The goal is to optimize, coordinate, train, educate, and provide the necessary leadership, development, and life skill necessary for youth to advance scholastically, socially, and mentally in life and in the broad academic arenas. We would appreciate the opportunity to provide positive role models and support young people in the community in which we serve. Finally, the Brothers would like to extend the arms of our hospitality in only the way the brothers of Alpha can--at OHL’s signature social events benefiting our chapter and education foundation, such as, the Annual Preakness Day social affair and the OHL’s Education Foundation Scholarship Brunch. We hope that you will continue to visit us here and stay involved with the chapter as we move onward and upward towards our fraternity's great aims of Manly Deeds, Scholarship and Love for All Mankind!